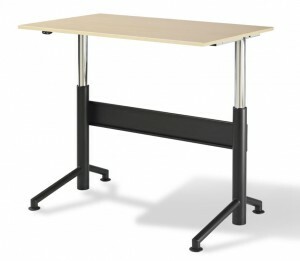 The Vertdesk is made by Beyond The Office Door that prides itself on quality and ease of use. It shows in the products they make, and the eponymous Vertdesk is no exception. Mounted on a steel frame with a crossbar specifically designed to increase stability and solidity throughout the entirety of the Vertdesk’s range of adjustment, the actual desk surface is made from an expansive, piece of maple or cherry, which is the option I chose. The desk surface itself is well-suited to the holding of a computer monitor, keyboard, mouse, and books and/or papers. With a maximum load bearing capacity of 200 lbs., you have the option of placing your computer on-top of, to the side, or even under the desk. With a clearance of 22.5 inches even at its lowest setting, this shouldn’t present a problem unless the computer in question is some ancient, hulking relic from the past. As for the actual range of this adjustable height desk, this standing desk is capable of reaching a maximum height of 46.5″ for standing activities. 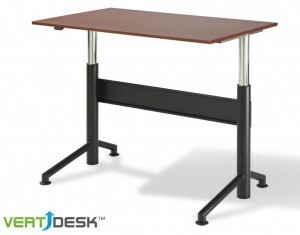 When the time comes to sit down, the Vertdesk can be lowered to a height of 28″. Throughout the entire range of motion, adjustment is achieved through the action of specifically designed gear and spindle drive systems crafted by German engineering teams. 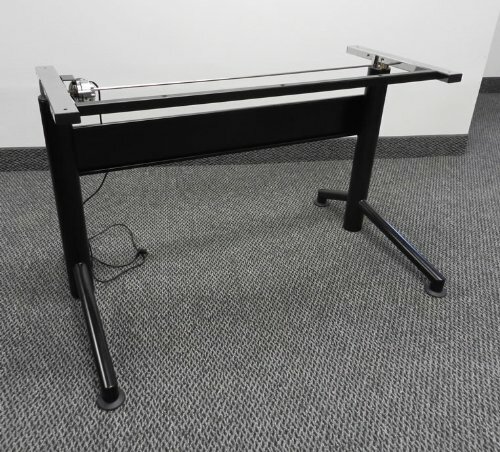 This system makes adjusting the Vertdesk’s height smooth and silent all in a measure; just touch the unobtrusive “up” and “down” buttons, and you’re set. Actually, it’s worth noting at this point that systems such as these are usually found only in an adjustable height desk costing $100 USD or more. You can tell that the gearing is quality, only a slight whir is heard while lifting or lowering the desk. Check it out in the video. The Vertdesk is ideal for those who wish to pair the use of a standing desk with the use of a treadmill. This is a popular combination used primarily for its health and energy boosting benefits. One note of caution, though: The Vertdesk is an electric model, and that means you’ll need an outlet not only for it, but for any peripherals used alongside it, including a computer, monitor, treadmill, and so forth. A simple power strip / power bar should do the trick here. One more thing about powering the Vertdesk: If the plan is to use this unit outside of North America, careful attention must be paid to the destination location’s power grid! The Vertdesk is designed around a 110-volt power supply. Improper use of other wattages, if they can be used at all, could result in property damage, personal injury, or even death. Be careful! Happily, a simple travel adapter kit is usually all that’s required to mitigate this issue. 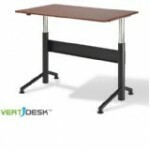 One of the things I found great is that the Vertdesk company, along with its namesake, is built upon a reputation of quality and customer care. Even so, things come up, and that means addressing the issue of returns. Buyers wishing to return their Vertdesk will find the process quick and painless. Just return the unit within the thirty day, unconditional / no questions asked return window, and Vertdesk will dispatch a FedEx delivery truck to come to your home or office and retrieve it. Not only is this a zero-cost procedure on the part of the user, it’s also a total, 100% money back guarantee. In other words, buying a Vertdesk is as risk-free as you can get! While matters of shipping are being discussed, it should be pointed out that the delivery of the desk I ordered arrived quickly, and the company states that next-day shipping is used in virtually all cases. Special arrangements can, of course, be made at the time of purchase. As this Vertdesk review has tried to demonstrate, the Vertdesk is a fine piece of office furniture, both from an aesthetic and utilitarian standpoint. Not only do I think this adjustable height desk looks great, but it has made a marked improvement on my productivity, stress and anxiety levels previously brought about by the forced constraint of a standard “sit down desk”. In addition to promoting general wellness, vitality, and overall health. There aren’t many pieces of furniture that allow the user the freedom to finish their work while combatting heart disease and obesity, but the Vertdesk is just that. The ultimate decision to purchase or not is obviously up to you, but hopefully you now has a solid grasp of the Vertdesk’s pros and cons, and are better able to make the best possible decision for your own needs. All that remains now is to try it out. After all, with so much to gain through the use of a standing desk like this one and so little risk on the part of the customer – read: none whatsoever! – there’s absolutely no reason not to give it a spin! Whatever the decision, hopefully this review helped you make it an informed one. Happy shopping!